...I came to know the Lord after having my daughter Desirée when I was in high school. She was my motivation for going to college, and the Holy Spirit was my inspiration for going to Bethel. I had no idea why God was calling me to seminary, but I knew He was. I also had no idea how I'd pay for it as a single mom. People told me that if I was meant to go to Bethel, God would provide. Like many students here, I held on to that belief. And He did provide, through donors like you, every term that I was here. Today, I am a writer, a hospice chaplain, and a fundraiser helping the next generation of Bethel students with their tuition. One of the many donors who contributed to my education during the four years I worked on my Masters in Theological Studies was Rae Lindgren. 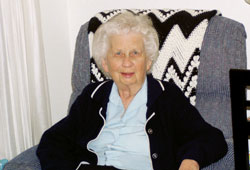 Rae began faithfully donating to Bethel in 1994. She wanted to help students who in turn would help others. Little did she know that her investment would one day help her as well when she needed it the most. I met Rae in July 2015 when I went to work for Dean Arnell Motz in the Development Office. I learned that Rae not only gave to Bethel throughout the last 20 years of her life, but she also made plans to leave her money to Bethel when she died. Arnell told me that Rae was in her 90s, widowed, had no children, and her family was out of state. He said Rae was a part of the Bethel family, and we needed to look out for her. So I checked in on Rae over the phone, visited her at home, and took her to her favorite restaurant where she had spent date nights and anniversaries with her late husband Warren. She often spoke about dying but was not afraid. Rae's concern was that the students of Bethel would be taken care of after she was gone. Rae had Bethel on her emergency contact list. When we got a call that she was in the hospital, I went to her side every day to minister to her and advocate for her. Nurses would ask if I was her daughter. Then they'd look at her chart and in pity say, "Oh, she has no children." I'd correct them, "She has more than one hundred children who she's helping put through college. I was one of them." When Rae was moved to a hospice home, I stayed by her side as promised. I didn't want her to be alone when she passed, so I asked one of the nurses to check her vitals before I ran out to get food one night. Everything seemed stable and normal, but when the nurse listened to Rae's lungs, she jumped back a bit and said, "Woe! That was weird. Hold on; let me check again." She readjusted the stethoscope, put it back on Rae's chest, closed her eyes, and smiled while she listened. "There's music playing in her lungs," she said. I asked if Rae was humming in her sleep. "No, there are metal instruments playing," she said. "I've witnessed many miracles as a hospice nurse. This is a new one." I thought about the scriptures that speak of trumpets blasting to call the congregations together or to call people home to be with the Lord. I knew this was the sign I needed from God to tell me to stay put. I read scriptures to Rae about eternity in paradise and played hymns on my phone about the assurance of salvation as she journeyed peacefully into Heaven. I presided over Rae's service and ministered to her family and friends. I never thought I would do this work, and I couldn't have done so if it were not for the education I received at Bethel and the financial support of donors like you. Thank you! I love being a hospice chaplain. It is a blessing and a privilege to hold the hand of a dying person when God takes them by the other.